Most people know they’ve fallen madly in love when they’ve spent enough time around their partner to feel comfortable, safe, and loved in return. But what happens when there are other feelings to take into account other than just the two of yours? 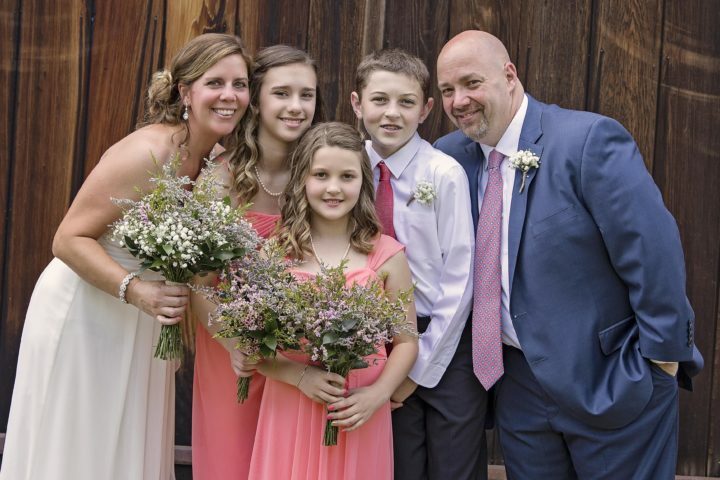 A blended family may face certain challenges other relationships won’t, including how to take the next step in the relationship when you’d like to tie the knot! First, let’s cover what a blended family is. A blended family is a couple who is together who also has children from previous relationships and perhaps the current relationship. The Stylish Occasions team works with a wide variety of couples, and we want to celebrate the blended families we’ve worked with. If you and your partner are working to weave together your families seamlessly, we’ve compiled some advice for what to do when creating your unique wedding ceremony. We’re assuming by this point, you’ve either met your partner’s kids or you’ve introduced your partner to your kids (if not, check out this helpful article on how to meet your partner’s kids). Nothing will make the kids feel more left out and alienated than not being included in the wedding plans. They need to be made to feel secure and valued, and that includes on the wedding day. It’s a busy, stressful day for everyone, including them, so be sure to clue them in to what’s going on and what their role will be the day of the wedding. 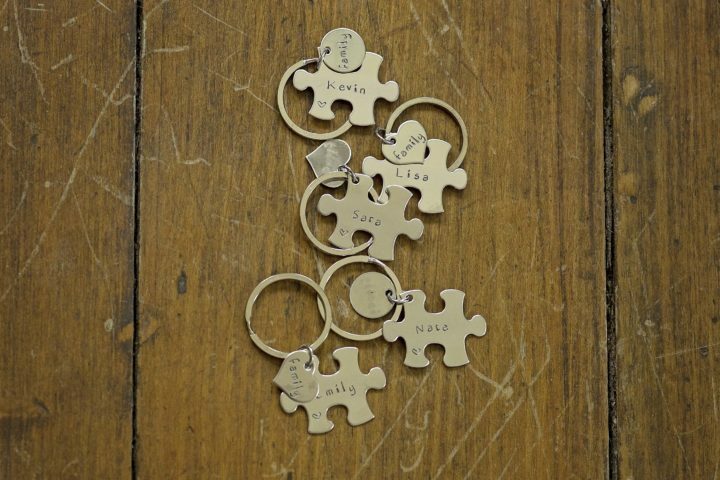 This couple decided to give puzzle piece key chains to their kids during the ceremony to commemorate them coming together as a new family. Depending on how old the kids are, ask them to be a part of your engagement photos. Have fun together as a family goofing around and taking photos. When you get your proofs back, pick one and order a print (or several, or better yet: create an album together!) to hang up in your home. It will serve as a constant reminder you’re all in this together and excited for the future. Share your photographs in real life with your loved ones! It can be easy to get caught up in the love you have for your partner and your excitement at starting a new life together, and that is TOTALLY acceptable! It is your wedding, and you should be throwing in some elements that feel like YOU. Just don’t forget to let the kids have some time to shine on the day of the wedding! Let them contribute to the playlist! They’ll love hearing their song come on during the reception and getting to dance to it. Get them to help you DIY your decorations. Put your kids to work if they are the crafty-type! Let them pick a piece (or all) of their attire for the wedding day. Let your kids pick some menu items if they are foodies! We’ve seen some weddings do a late night French-fry bar for guests, and it was a huge hit with young and old. There’s so many ways to make sure your kids are included on the day of the wedding. Get creative! This couple had a sand ceremony with sand for each of them as well as the groom’s son to pour during the ceremony to signify them blending together. Depending on the ages of the kids, you’ll have to get creative with how you incorporate your blended family into your wedding ceremony. If you have an older child, maybe put him or her in charge of the rings. Some of our families have had a family prayer circle during the ceremony, or have planted a tree as a ceremony to show unity in their family. Pick something special to you, your partner, and your kids. Through the planning process, don’t forget to carve out time for just the two of you. It’s important to invest in one another so you can invest in your family. The StylishO Team wants to hear from you! Do you have a blended family? What suggestions would you give to those getting married who will be bringing together two families? Electronic Save the Dates - Yay or Nay?